There is a universal relevance of the act of “shoe throwing” in today’s time and age that such incidents have occurred in both developed and underdeveloped countries alike. The symbolic meaning behind hurling shoes is that they are contaminated with dirt and equate to throwing dirt on that individual. The symbolic meaning behind this act is to express disdain and humiliate opponents especially world leaders, by people belonging to diverse ideologies including religious zealots, and fanatics in general. During the last decade in Pakistan, these incidents have occurred several times involving prominent Pakistani political personalities. Some of the victims of this act have been the PPP Chief Asif Ali Zardari (in Birmingham), former Sindh CM Arbab Ghulam Rahim, and former dictator General Pervez Musharraf. In the last few weeks, the top leadership of the PML-N, has been the victim of such kind of incidents, repeatedly. Firstly, the Interior Minster Ahsan Iqbal, then Foreign Minister Khawja Asif, and the very next day former Prime Minster of Pakistan and now designated as Quaid of PMLN party Nawaz Sharif became victims of this practice. Despite these incidents, PML-N’s top leadership has refrained from blaming the actual perpetrators: the Tehreek Labiak Ya Rasool Allah (TLYRA), who have continuously been provoking their followers to commit these acts by instigating hate speech and inciting violence. Instead the party and its leadership has been engaged in blaming their political rivals and the establishment. So much so that the PML-N’s Punjab law minister blamed PML-N’s arch political rival Imran khan for the “prevailing shoe-throwing culture”. It is no secret that the people involved in shoe hurling at Nawaz Sharif or throwing ink on Khawaja Asif were greatly influenced from the inflammatory speeches of Mualana Khadim Hussain Rizvi, head of Labaik Ya Rasool Allah and “Ameer” of its political wing Pakistan Labiak Party. TLYRA greatly praised and glorified people involved in perpetrating religious violence especially over the issue of blasphemy in their religious gatherings. In the last couple of months, the PML-N has been caught in the crosshairs of angry religious fanatics, belonging to the TLYRA, due to their alleged involvement in amending the clause of Form A, which mentions Muslim candidates’ belief on the finality of Prophet, of the Election Act 2017 Bill, and the execution of Mumtaz Qadri, killer of former governor Punjab Salman Taseer. TLYRA is of the opinion that the drafted bill somehow equates to committing blasphemy and holds the ruling party PML-N responsible for it. On this issue, TLYRA Chief Khadim Rizvi and other associate clerics like Ashraf Asif Jalali, Afzal Qadri and many others have been openly delivering provocative speeches inciting violence, arranging regular conferences and processions on the issue of “Khatm-e-Nabooat” (finality of the Prophet-hood) across the country. The 20+ day procession and sit-in at Faizabad, the juncture between Islamabad and Rawalpindi, in November last year saw the beginning step in this direction, where it appeared that the state bowed to their demands. It is worrisome that since then hundreds of people have joined their movement and been radicalised. The main issues which they have politicised and developed their own narrative over have been blasphemy, secularism, liberalism, and modernism. These are also topics which they have using to incite violence in public. 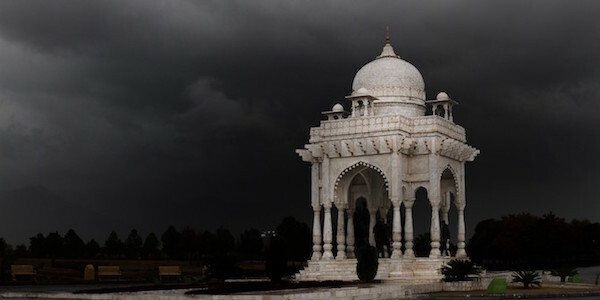 Dark skies over Fatima Jinnah park. Photo source: Syed Hammad Hassan, CC BY-SA 4.0. Moreover, different political parties and state institutions are openly abused, and hate speech is openly propagated at these processions and platforms, but no significant action has been taken against them. Even recently, the Anti-Terrorism Court has declared TLYRA Chief Khadim Rizvi and other leaders of the party absconders but still haven’t arrested them, in spite of openly arranging religious gathering across the country. The nursery of these radicals is gradually growing in the society and spreading its roots in different parts of the country. It has been observed that not all Barelvi madaris support TLYRA, their students are becoming influenced and radicalized by the TLYRA leaders’ speeches. PML-N has a history of cordial relations with many Barelvi madaris including the Jamia Naeemia, Lahore, however, in spite of this when the incident against Nawaz Sharif ensued, there were reports that some students of Jamia Namia also chanted slogans against Nawaz Sharif over the issue of blasphemy and in support of Mumtaz Qadri. The growing trend of radicalisation and such kind of incidents in the society indicates that the possibility of such instances in future, cannot be ruled out. It is also worth-mentioning that previously PML-N itself has been actively involved in politicisation of the religion against its opponents, especially against the former PM Benazir Bhutto, and has a history of supporting banned religious organisations and their leaders like the Ahle Sunnat Wal Jamat (ASWJ) in Punjab. Nawaz Sharif’s son-in-law Captain Safdar has been active in agitating people against Ahmdis, on issue of blasphemy and finality of the Prophet Muhammad. Moreover, on different occasions even during a speech in National Assembly, he declared Mumtaz Qadri a ‘hero’, which either shows the party’s confusion or is a clever tactic to secure the Barelvi vote bank for the upcoming general elections, despite the social, moral or religious repercussions it might have on the society. These kind of policies are problematic on one hand, as they incite violence among public by politicising the religion, whereas on the other, they glorify killers and elements which are not only a threat to the law and order of the country, but are damaging the democratic values of the country. However, it is a good omen that leaders of all mainstream political parties including Asif Zardari, Imran Khan, Bilawal Bhutto etc. have condemned the incident which shows their political maturity toward democratic values. As the general elections draw near and all political parties initiate their election campaigns by staging processions in big cities, it is feared that if the trend is not condemned and discontinued, it may become a norm and embarrass many national leaders, especially during election campaigns. The ruling party has also shown its weakness and inefficiency in tackling this issue. Despite multiple promises ultimatums and the Islamabad High Court ruling, the Raja Zafar Ul Haq committee report has not been made public. This act of PML-N is ensuing more controversy and doubt against PML-N’s government and their desire to resolve this impending crisis. The conundrum here is that if the PML-N intentionally changed the article about the finality of Prophet for political gain to divert the attention of people from Panama and Sharif family’s legal battle in the Supreme Court, then this may have been to their detriment rather than their gain.